Dynamic Investments enable Exchange Traded Funds to become mainstream investments and unleash the power of the ETF investment type to maximum strength. With the coming of Dynamic Investments, ETFs will far exceed those of mutual funds. The World of ETFs Is About to Change! This page is password protected and can only be accessed by BlackRock personnel who I, Leland Hevner, President and Research Director at the National Association of Online Investors (NAOI), have communicated with directly. A major focus of NAOI Research and Development involves maximizing the potential of Exchange Traded Funds (ETFs). At the NAOI, we believe ETFs to be one of the most significant developments in the world of investing since mutual funds were introduced in the 1980’s. Yet, in our opinion, ETFs are massively under-used today. Our research shows that this is because of the universal use of Modern Portfolio Theory (MPT), an approach to portfolio design that suppresses their unique benefits. MPT methods embrace a buy-and-hold portfolio management strategy whereas ETFs shine in a dynamic, buy-and-sell environment. The dynamic environment needed to fully unleash the power of ETFs has just been created by the NAOI. Developed by the NAOI following a multi-year R&D effort, Dynamic Investment Theory (DIT) and Dynamic Investments (DIs) will change the way we invest from “static”, as it is today, to “dynamic”, as it will be in the future. NAOI Dynamic Investments finally enable ETFs to become not only mainstream investments, but the preferred investment type of the public. ETFs are an extremely powerful investment type. They hold groups of equities like mutual funds but have the benefit of trading like stocks, making them easy to buy and sell. Unfortunately, the full potential of ETFs is not being realized today as they are typically bought as one component of a traditional MPT, buy-and-hold portfolio. And because ETFs have low expense ratios, advisors are not likely to recommend them to clients when mutual funds provide them with much higher commissions and fees. As a result, individuals view ETFs today as little more than "quirky" mutual funds. This misconception ends with the introduction of NAOI Dynamic Investments. In the future world of NAOI Dynamic Investments (DIs), ETFs will be free to shine. ETFs are the main building blocks of DIs. Each is designed with a Dynamic ETF Pool (DEP) component that contains ETF candidates for purchase. At periodic Reviews only the ETF in the DEP with the strongest price uptrend is bought and held until the next scheduled Review. Because of their ease of trading and low costs, ETFs enable a DI to adjust its holding quickly, efficiently and inexpensively in response to changing economic and market changes. At right is a diagram of a DI’s components. More information can be found at this link. In the future world of “market-sensitive” Dynamic Investments, the true power of ETFs is unleashed and investment returns that today's "experts" will say are impossible suddenly become probable. Let’s see how. 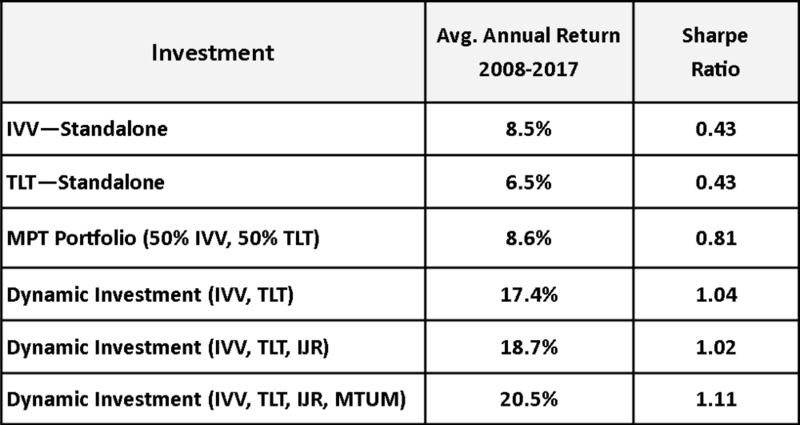 The table below shows in the first two data rows the compounded returns of IVV and TLT for the 11 year period from the start of 2008 to the end of 2017. The third row shows the returns of an MPT portfolio that holds both of these ETFs with a 50% allocation to each. In rows 4,5 and 6 I show the performance of Dynamic Investments with the ETFs in their Dynamic ETF Pools shown in parenthesis. Row 4 is a DI that holds only IVV and TLT in its DEP and rotates between them based on a periodic sampling of the price trends of each. Only the ETF with the strongest price uptrend is purchased and held until the next Review event. Then, in rows 5 and 6, I illustrate how adding more ETFs to the DEP can increase returns without additional risk as shown by the Sharpe Ratio going up with the returns. The Sharpe Ratio is a measure of the amount of return achieved for each unit of risk taken and the higher the better. The MPT portfolio holds both winning and losing ETFs at all times. This design reduces risk but also reduces returns. The Dynamic Investment is “time-diversified”, periodically and automatically signaling trades to hold only the ONE ETF from the DEP with the strongest price uptrend. This design reduces risk and ENHANCES returns. Adding more ETFs to the DI's Dynamic ETF Pool increases returns by giving the DI more areas of the market to search for stronger price uptrends. Using DIs, increased returns do not come at the expense of higher risk as evidenced by the Sharpe Ratio going up in lock-set with returns. Keep in mind that changes to the DI’s ETF holding are made based on the internal intelligence designed into the DI using empirical observations of objective data - not based on subjective human judgments as they are today. As such the ongoing DI management process can be easily automated. This simple example illustrates how the full earning power of of individual ETFs is released by the DI design. An Expanded Product Line Virtually Overnight! There are an unlimited number of DIs that can be created by combining ETFs into the Dynamic Investment structure. And these DIs can be designed to meet virtually any investing goal. By focusing research and development resources on creating Dynamic Investments, ETF developers can expand their product lines exponentially without the need to create a single new ETF. The diagram below shows a new ETF derivative product layer in the form of a complete Dynamic Investment product line that will increase product revenues exponentially. Not only does the development of DIs expand an ETF Developer's product line virtually overnight, it also significantly expands market reach as discussed next. The introduction of DIs opens significant new markets for ETF developers. Because each DI is a comprehensive investment "product" with built-in management, DIs can be sold directly to the public via catalogs in conjunction with NAOI educational materials that show how to easily implement and manage them. ETF developers will also sell them directly to newly formed Dynamic Investment Designers who will be trained by the NAOI to transform standalone ETFs into powerful Dynamic Investment products. Presented below is a diagram that shows the entities and product flows in the dynamic and revitalized ETF marketplace of the future. The black lines and letters in the diagram show what exists now; the red lines and letters show the new markets, the products and the new sales channels that will be available to ETF developers in the near future. You can easily see the benefits that accrue to ETF Developers in this new market environment. Not only will they have new and better products to sell in the form of DIs, they will also have new markets in which to sell them. This is a marketplace that will generate far higher revenues than the one that ETF developers work with today. Virtually all ETF developers have in their product line ETFs that just don’t sell. Perhaps their focus is so narrow that they are too volatile for today’s buy-and-hold MPT portfolios. Such failing ETF products can be expensive to maintain and many are pulled from the market. DIs rescue these ETF “orphans”. They can simply be placed in the Dynamic ETF Pool (DEP) of a DI with a Stock and a Bond ETF where they will be purchased only when they are moving up in price more strongly than Stocks or Bonds and then they are quickly sold when their price starts to trend down – thus reducing their volatility exponentially. As one element of a DEP, a volatile ETF that has very low sales volume can be a major asset and its value restored in an ETF product line. ETF Developers need guidelines for planning the expansion of their product line. When Dynamic Investments are a part of that product line new ETFs can be green-lighted based on how they perform in a Dynamic ETF Pool. For example, using the ETFs shown in the table at right as elements of a Dynamic ETF Pool produce incredible returns. Based on this, BlackRock might do well to consider creating ETFs that mimic RZG (Invesco) and EDV (Vanguard). They have shown the capacity to take advantage of price uptrends that ETFs in the current BlackRock product line do not. NAOI students have been using Dynamic Investments designed by the NAOI for over two years. Very few have problems implementing and managing them on their own using an online broker. Typically they only need to spend 15-20 minutes on this effort 4 times per year, at the end of each fiscal quarter. Still, DI use would appeal to a far larger audience if they were encapsulated in ETF format. This is another goal that can guide an organization’s strategic product development plan. 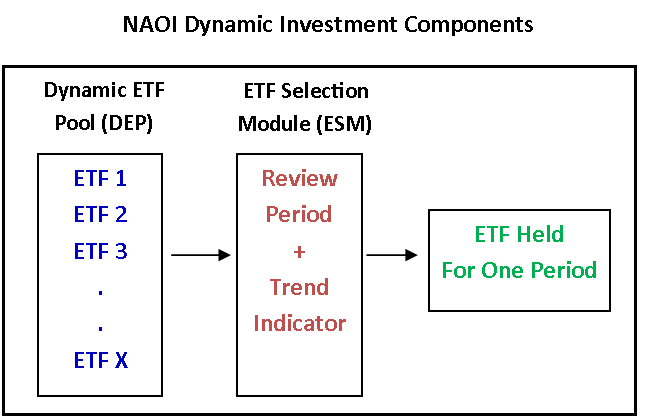 NAOI Dynamic Investments uncover massive hidden value that currently exists in an ETF product. This is the value of combining existing ETFs in the Dynamic Investment structure. DIs essentially enable developers to monetize ETF combinations in the manner discovered and developed by the NAOI. An NAOI consulting contract shows how. The world of ETFs today is getting crowded. It seems that there is at least one ETF that tracks virtually every index in existence. This is pushing ETF Developers to create ever more narrow and exotic ETF types. The problem is that these new ETFs are either too volatile or too complex for public consumption, especially when the only place to put them is in a buy-and-hold, MPT portfolio. NAOI Dynamic Investments break the product development log jam. In the future of investing, innovative ETF Developers will create new products in the form of DIs that combine existing ETFs into the NAOI dynamic structure. By doing so, ETF / DI developers can greatly expand their offerings with little cost or effort and significantly broaden their market reach. Both actions will generate significant new revenue streams virtually overnight. And, as a final thought, consider this. Feedback from NAOI students how are currently using Dynamic Investments wonder why anyone would invest in any other way. As the NAOI continues to make the public aware of this superior investment, they will demand them. Those organizations that meet this demand will have a massive competitive advantage and thrive. Those that don’t will lose business. That’s just how evolution works. The NAOI has been working on DIs for close to 5 years. We not only researched and created a new theory of investing and investment type, we also field-tested this new approach for over 2 years using NAOI students. Their feedback has enabled us to refine not only how DIs work but how they can improve virtually all areas of the investing world from how portfolio designers and financial advisors will operate in the future of investing to completely revamping how retirement accounts of the future will work. We have also developed the educational resources and marketing materials needed to explain and sell Dynamic Investments to the public and and enable individuals to use them on their own if they wish.